Using Wikki Stix to make footprint crafts provides a unique art experience for kids! Not only will kids enhance fine motor skills and hand-eye coordination in the creating process, but Wikki Stix makes FUN 3-D footprint crafts! Try the ladybug, the bumblebee, or the butterfly with your own kids for one-of-a-kind keepsake crafts this spring! 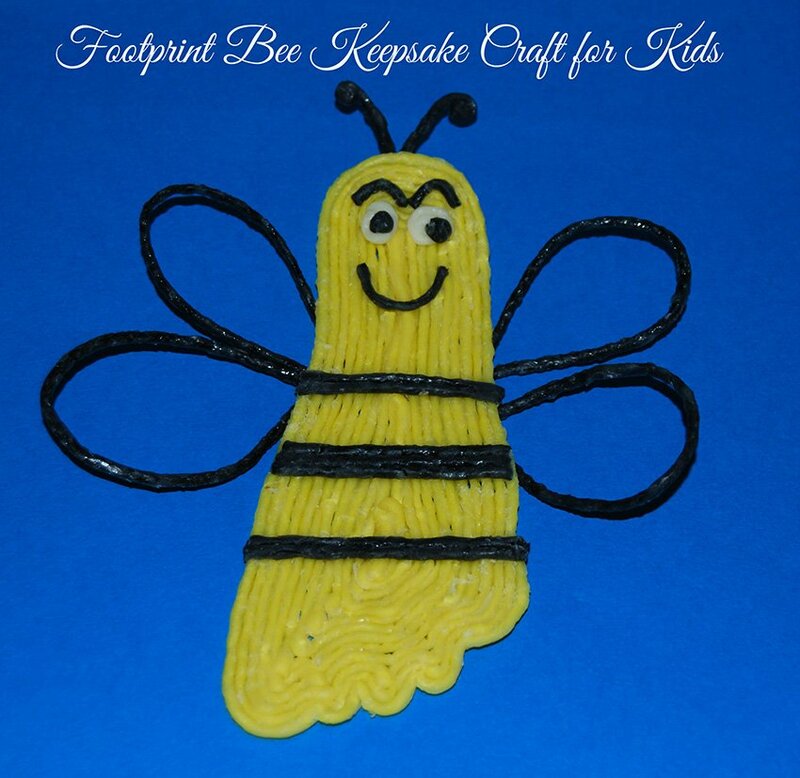 Wikki Stix Bumblebee Footprint Craft for Kids! Instructions: Trace around your child’s footprint with a pencil on a piece of white paper – older kids can trace their own footprint onto the paper. Invite the children to use yellow Wikki Stix to outline the footprint. Additional yellow Wikki Stix should be used to trace inside the initial outline until the footprint is completely filled-in (see photo above). Bee Features: kids can create eyes from small white and black Wikki Stix balls. 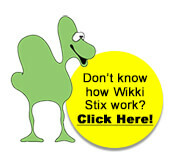 The antennae, eye brows, mouth, and body designs are created with cut black Wikki Stix. The bumblebee’s wings are made from 4 black Wikki Stix (2 on each side) that are formed into loops and pressed to the back side of the footprint (bee). If desired, the footprint can be lifted from the white paper and mounted to scrapbook paper or hung as a decoration by making a loop hanger from Wikki Stix and pressing the loop to the backside of the craft. 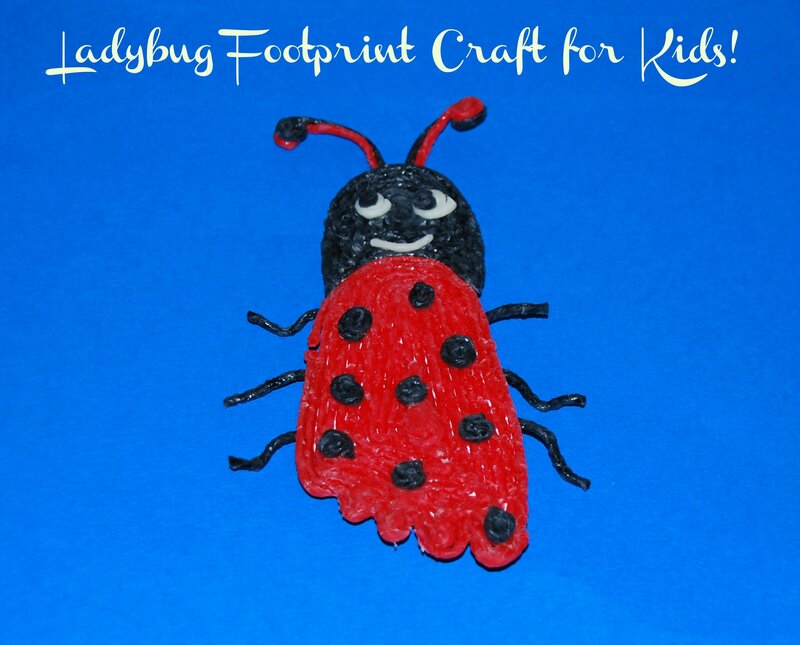 Wikki Stix Ladybug Footprint Craft for Kids! Instructions: Trace around your child’s footprint with a pencil on a piece of white paper – older kids can trace their own footprint onto the paper. Invite the children to use red Wikki Stix to outline part of the footprint and black Wikki Stix to outline the heel part of the footprint. Additional red and black Wikki Stix should be used to follow inside the initial outline until the footprint is completely filled-in (see photo above). Ladybug Features: invite the children to cut small pieces of black Wikki Stix to make balls for the ladybug’s spots. Kids can also create eyes from small white and black Wikki Stix balls and a mouth from a cut piece of white Wikki Stix. Black or Red Wikki Stix cut in half will form the antennae (press behind the head of the ladybug). For the legs, cut 3 black Wikki Stix in half (6 total pieces). Behind each side of the red ladybug body press 3 black halves to resemble the ladybug’s legs. 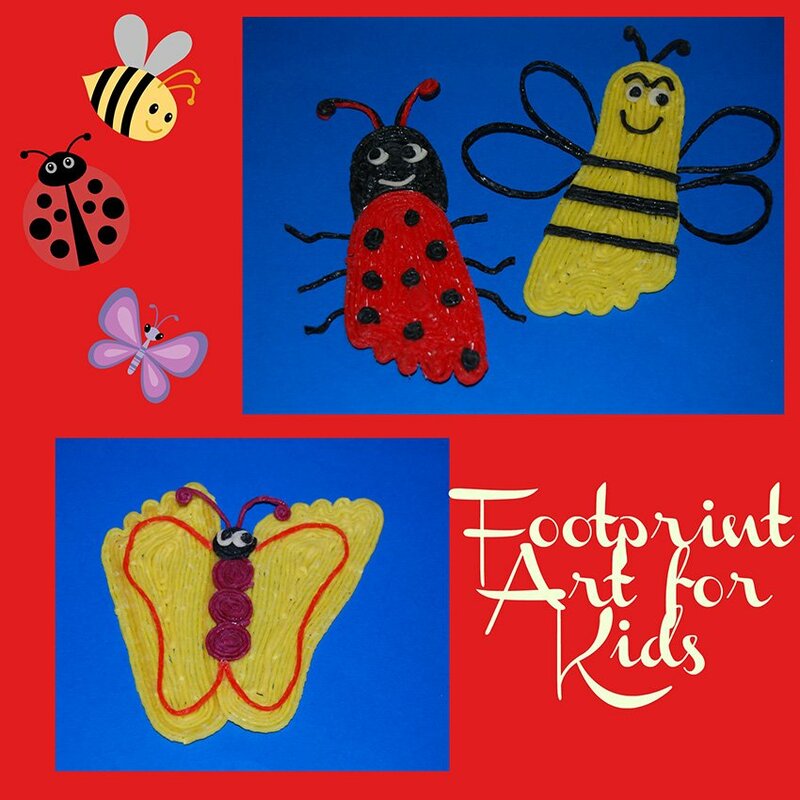 Wikki Stix Butterfly Footprint Craft for Kids! Instructions: Trace TWO of your child’s footprints with a pencil on white paper – older kids can trace their own footprints onto the paper. Invite the kids to outline each of the footprints and fill the footprints in with additional Wikki Stix (tracing inside of the original outline). The footprints will become the butterfly wings when lifted off of the white paper (see photo above). To create the butterfly’s body: have the children use one strand of Wikki Stix (any color) and wrap it tightly around itself to create a spiral or pinwheel shape. Four of the spirals are then used to form the butterfly’s body/head. Place the footprints side by side (overlapping slightly) and then press the Wikki Stix spirals in the center of the footprints to form the body and head of the butterfly craft (see photo above). Butterfly Features: kids can create the eyes from small white and black Wikki Stix balls. The butterfly’s antennae can be created with any color of Wikki Stix, cut in half, and then pressed behind the butterfly’s head. 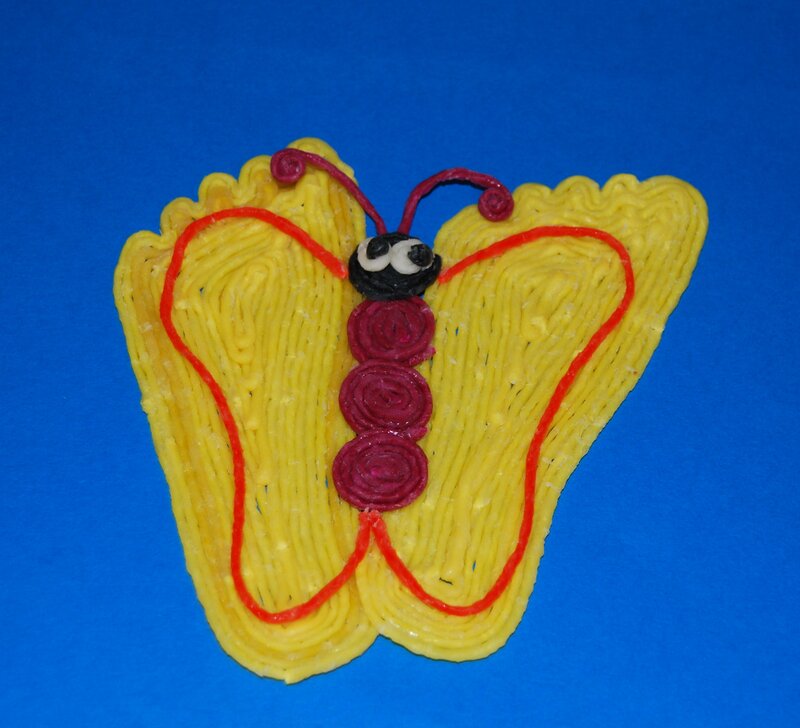 Kids can decorate the butterfly’s wings as desired with additional colors of Wikki Stix. The footprint butterfly can be mounted to scrapbook paper or hung as a decoration by making a loop hanger from Wikki Stix and pressing the loop to the backside of the craft.